Built for a single family, the homeowners were keen on having open loft-like spaces while maintaining privacy from the street. 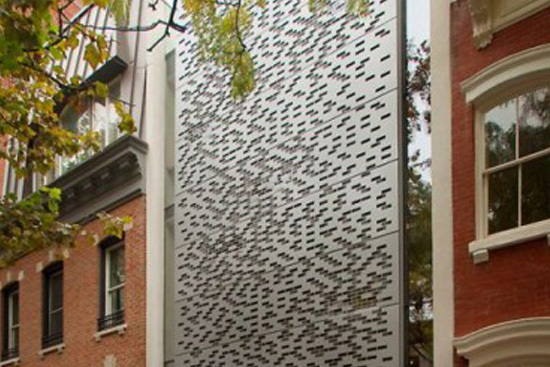 The result is the façade of water-cut aluminum sheets that are punctured with brick-shaped openings that reference the neighboring buildings, and two vertical glass slots that run the height of the house on either side of the screen. Directly behind the screen inside the house are a wall that has been transformed into a four-story bookshelf and a floating wood-and-glass staircase that wraps around an elevator shaft. With the staircase and elevator core anchored in the front of the house, the rooms are spacious and loft-like, spanning the entire 38-foot-depth of the building. The living room occupies the second-floor mezzanine, which overlooks the backyard as well as the dining room and kitchen on the ground floor, while the top three levels contain the bedrooms and baths. Juxtaposing with the house’s street façade, the rear is entirely made of glass with etched glass used for the upper three floors to maintain privacy. Its highly innovative and captivating exterior has an equally stylish mix of contemporary furnishings to match, including cascading spherical pendant light fixtures that light up all the floors, midcentury modern-style tables and chairs, and graphic abstract art.